Make This the Year that YOU Fight Hunger! Hunger Hike is a perfect fundraising event for your group — student organization, church group, civic group, team or family. Put together a Hunger Hike team and start raising money using our online fundraising site — or any other way you choose. 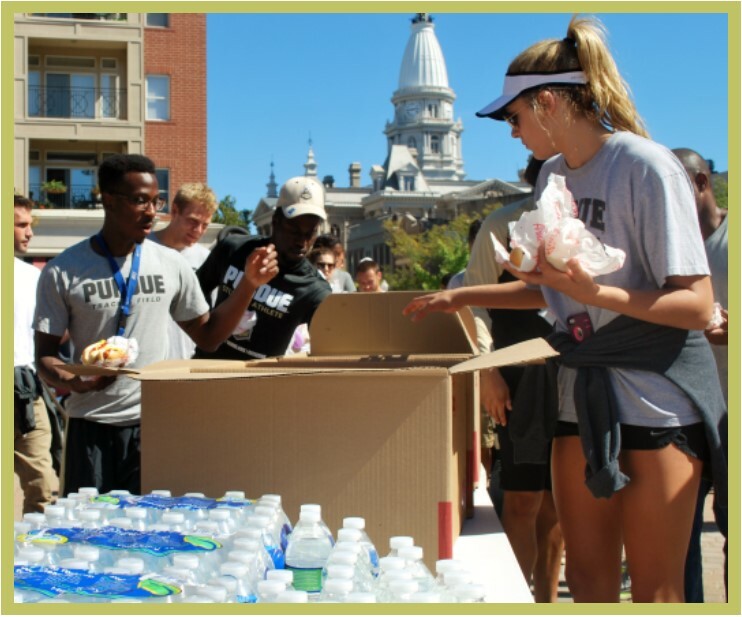 All Hunger Hike proceeds directly support the Lafayette Urban Ministry food assistance programs including the St. John’s/LUM Food Pantry; Food Finders Food Bank, Inc.; and St. Thomas Aquinas’ Haitian Ministry. This is YOUR opportunity to support these outstanding local organizations while engaging in a meaningful and fun community event. If you are a company owner — you also may become a Hunger Hike sponsor. For more information on how to become 2018 Event Sponsor, email hungerhike@lumserve.org. Hunger Hike is a community fundraising event whose mission is to Raise Awareness & Make a Difference in the Fight Against Hunger — locally, regionally, & globally. Get a head start in the hike & run to combat hunger. Hunger Hike is a perfect fundraising event for your group — student organization, church group, civic group, team or family. Put together a Hunger Hike team and start raising money using our online fundraising site — or any other way you choose. If you are a company owner — you also may become a Hunger Hike sponsor. 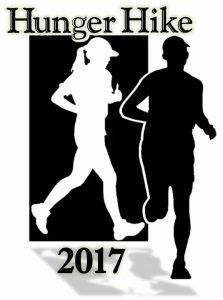 To become 2017 Event Sponsor, email hungerhike@lumserve.org. Bog Nature Area. 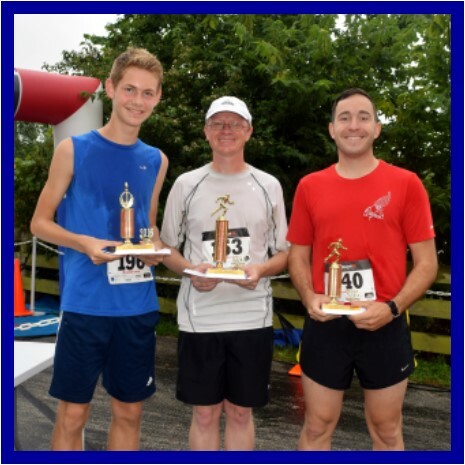 The rain cleared up just in time for the run, and it was a cool but cloudy morning — not a bad day for a race. 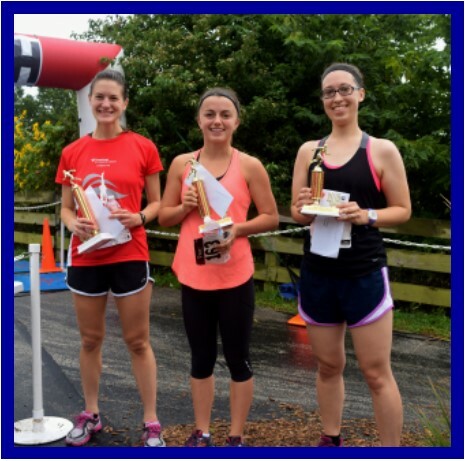 These runners supported these outstanding local organizations while enjoying a 5K event on a scenic trail. 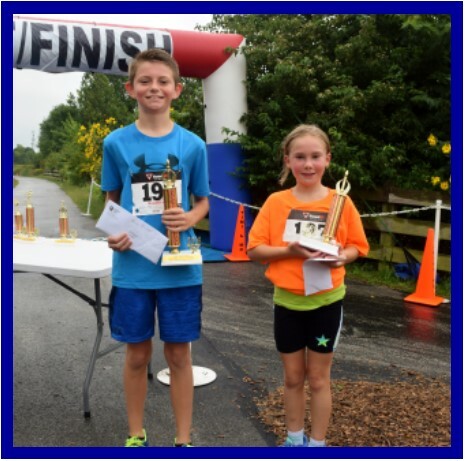 To view HH5K Run PHOTOS, click HERE. Participants gathered with one common goal—to raise awareness and raise funds for food programs locally, regionally & globally — through the work of Lafayette Urban Ministry, Food Finders and the Haiti Ministry at St. Tom’s. The events this past weekend though — offered even more. This year was special from beginning to end. Before it all began the crowd was treated to Zumba with Brooke & Kasie from Studio b Dance & Fitness and the National Anthem sung by Indiana State Representative Sheila Klinker & her daughter, Kelly Jacobs, director of music for the Cathedral of St. Mary. Throughout the entire event , there was live music by DJ Powder from Rat Pak Mobile DJs, face-painting & balloon animals from the Unlimited Smiles Clown Ministry, and massages from Lee Anne Akers of Essential Touch Massage. Amanda Elmore, US Olympic Gold Medalist (pictured above), gave a rousing keynote address preceded by remarks from Sharon Versyp, Purdue Women’s Basketball coach; Dave Shondell, Purdue Volleyball coach; Dave Kucik, Purdue Rowing coach; Sheila Klinker, Indiana State Representative; John Dennis, West Lafayette Mayor; Tony Roswarski, Lafayette Mayor; Joe Micon, LUM executive director; Fr. Patrick Baikauskas, OP, pastor/director of campus ministries, St. Thomas Aquinas; Katy Bunder, CEO/president, Food Finders Food Bank, Inc.; and Kyle Mann, Walmart Market Manager. 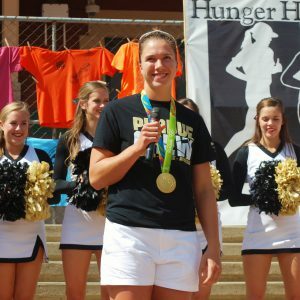 Amanda Elmore also kicked off the Hunger Hike. Purdue Pete, Purdue Cheerleaders, Purdue Crew Team, Purdue Women’s Basketball Team & Purdue Volleyball Team then led the hikers up the John T. Myers Bridge and on the Wabash Heritage Trail along the Wabash River. Hunger Hike concluded with a Celebration Picnic with hot dogs, chips & bottled water for all participants (Thanks to Texas Roadhouse, Frito Lay & Aqua Systems). Hunger Hike once again successfully brought much needed attention & funds to the battle against malnutrition, food insecurity & hunger. We’re so close to reaching our 2016 goal to raise more than $101,000. Each year 15% of donations are made in the two months AFTER Hunger Hike. Hunger Hike Fundraising Night at Texas Roadhouse. Buy a Hunger Hike T-shirt. 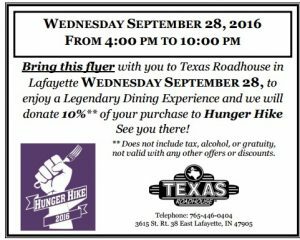 Texas Roadhouse, Lafayette from 4 – 10 p.m. next Wednesday, September 28. GIVE directly to Hunger Hike, click HERE. GIVE to a Team or Hiker, click HERE. Also — Fundraisers & Teams are encouraged to send another message to your friends & family. For a sample message click HERE. Use the tools in First-Giving to send messages & share your page on Facebook or Twitter. Working together the 2016 Hunger Hike goal can be achieved — and surpassed. You can still support Hunger Hike just by going out to dinner — WEDNESDAY, SEPTEMBER 28. Bring invitation to Texas Roadhouse, 3615 SR 38 E, Lafayette, on Wednesday, September 28 from 4 to 10 p.m. Hunger Hike gets 10% of your food sales — so, eat up! 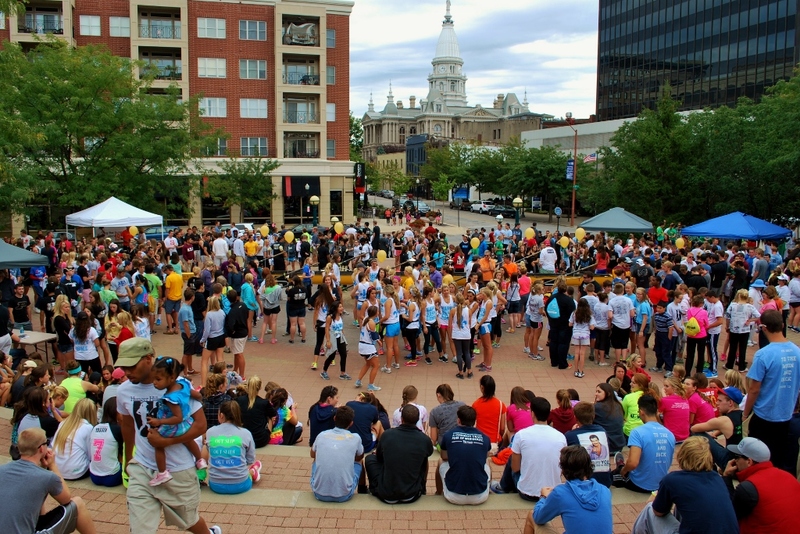 For more information on HH5K Run and Hunger Hike, please visit and explore our website at www.hungerhike.org. 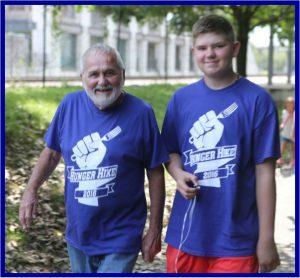 Hunger Hike events are just two weeks away — and a lot of exciting things are planned for the Kick-off event and the 5K run. Hunger Hike gives YOU a chance to have a positive impact on your community AND have some FUN too! 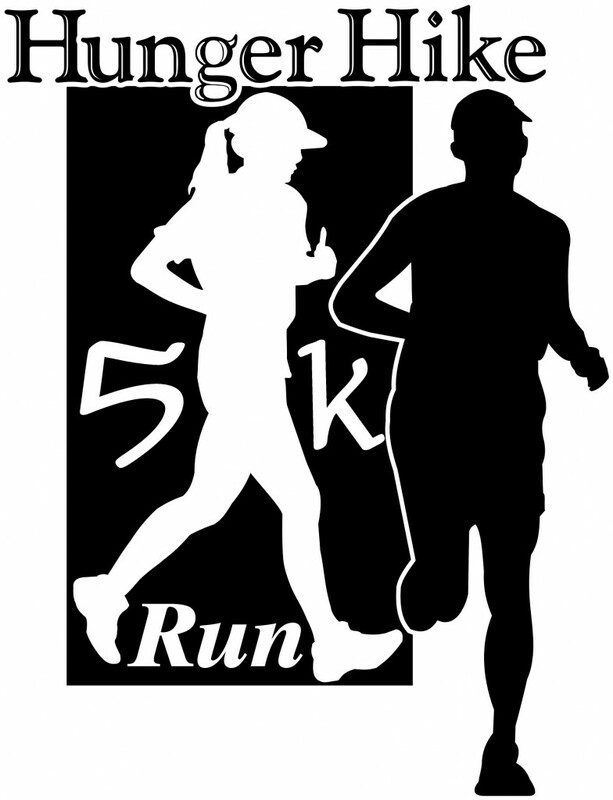 There’s a live DJ, Zumba, face painting, balloon animals, clowns, the Boilermaker Special, Purdue Pete & cheerleaders — and hot dogs, chips & water when you return from the 3K walk/hike. Hunger Hike is also a wonderful team activity for your group. Each member raises money leading up to the big day — and the whole team gets together at Hunger Hike & celebrates their good work. Email all of your contacts asking them to support you and Hunger Hike. You may simply email a message and the link to your fundraising page to all of your contacts —OR—upload your email addresses and let First Giving do the work for you. Finally. Watch the donations come in — for you, for your team and for Hunger Hike! If you choose to email your contacts outside of First Giving don’t forget to include the link to your fundraising page allowing your friends and family to donate to you online. When I learned that millions of children go hungry, I decided to do something about it. 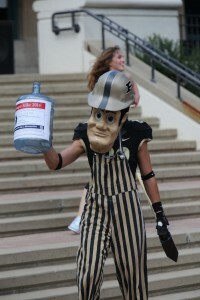 I’m going to participate in the Greater Lafayette HUNGER HIKE and hope you will support me. I’m excited to be a part of this annual effort which raises funds for three nonprofits working to fight hunger locally, regionally & globally: Lafayette Urban Ministry, Food Finders Food Bank, Inc. and the St. Thomas Aquinas Haiti Ministry. Any amount you can give will help! Please dig deep and donate through me online. Donating is simple, fast, secure and tax-deductible. Thank you for visiting my fundraising page. I really appreciate it. Together we will be helping hungry children and families. You can learn more by going to the Hunger Hike website(www.hungerhike.org). Thanks! Call or email us if you need any help (765-423-2691 | hungerhike@lumserve.org). So — take a few minutes this long weekend and get started fundraising for Hunger Hike. We hope you’ll consider joining our Fight against Hunger. For more information on how to become 2016 Event Sponsor, email hungerhike@lumserve.org. 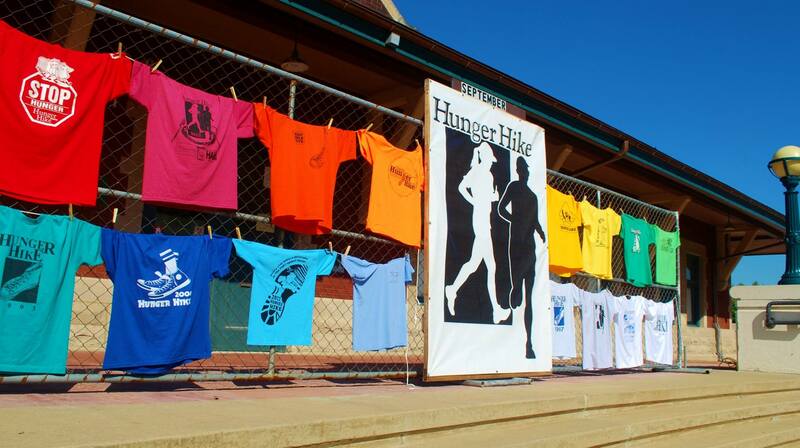 Hunger Hike T-shirts Sales, Sat. & Sun., Sept. 24 & 25 – Volunteer Sign Up HERE. 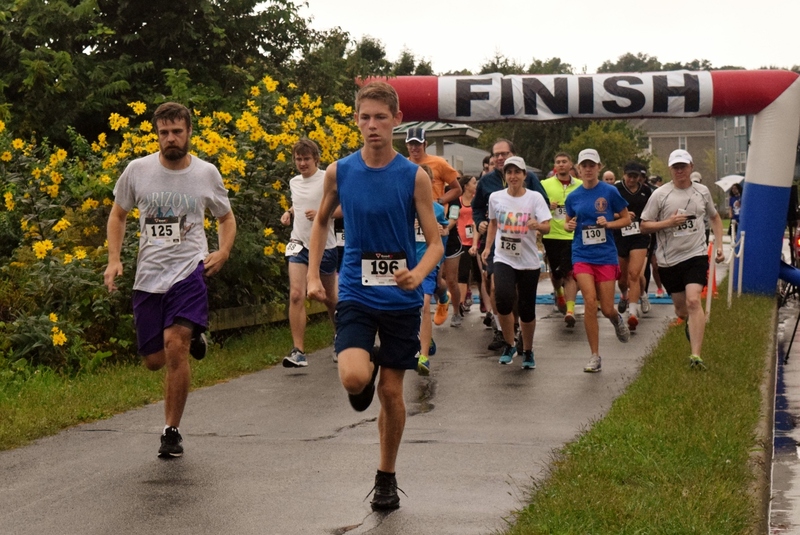 Hunger Hike events are less than three weeks away — and a lot of exciting things are planned for the Kick-off event and the 5K run. 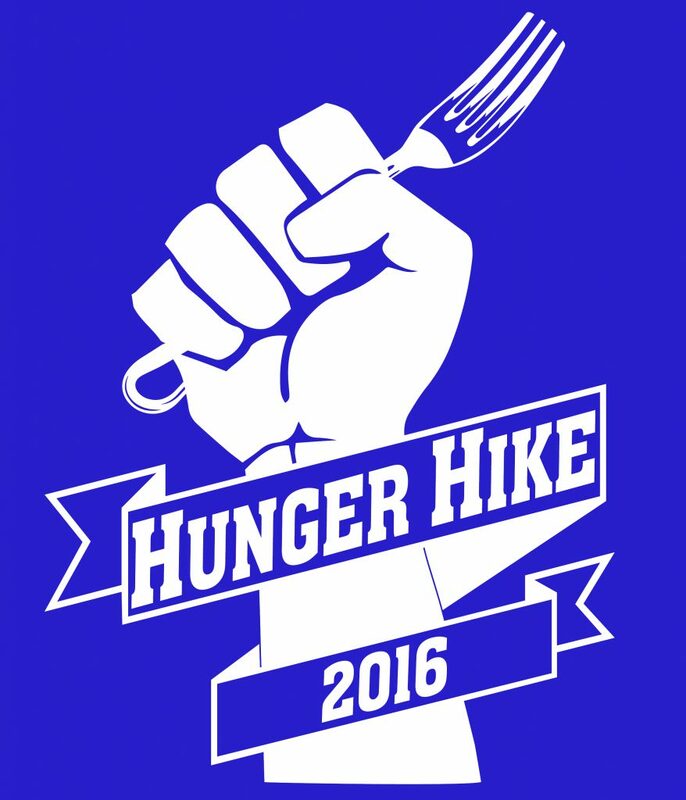 Please become a Hunger Hike participant today! Join Purdue Coaches Sharon Versyp, Dave Kucik & Dave Shondell in beating last year’s amount of $101,000 — and make this a record breaking year. Hunger Hike is a wonderful team or group activity. Each member raises money leading up to the big day — and the team gets together at Hunger Hike and celebrates their good work. And Hunger Hike is FUN! 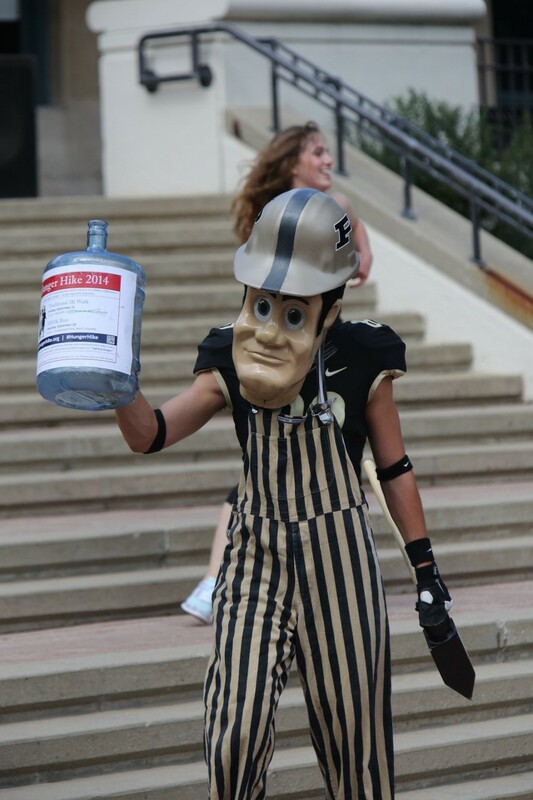 There’s a live DJ, Zumba, face painting, balloon animals, clowns, the Boilermaker Special, Purdue Cheerleaders, Purdue Pete — and hot dogs, chips & water when your return from the 3K walk/hike. Here are the details. To get involved in Hunger Hike 2016 and for more details — click HERE.